Think Skilsaw is just about circular saws? While their name inspires a rich tradition the classic power tool, they’re more than just circular saws these days. With one of the best jobsite table saws and a vibration-killing reciprocating saw available, they’re making waves in nearly every direction – even in concrete. We stopped by the booth to spend some time with their team and see what the best Skilsaw tools at World of Concrete 2018 are. 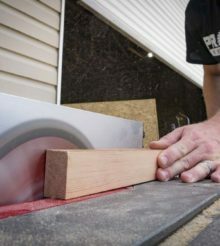 Fans of the original Skilsaw Medusaw like it for its smaller size on scoring jobs that really don’t need a full-size power cutter. Like many floor-level tools, it leaves something to be desired that our backs tell us about every day. If power cutters can gain a rolling cart, why not create a walk behind version of the Medusaw? Wish granted. The new Skilsaw Medusaw Walk Behind takes the original Medusaw and integrates an articulating handle with height adjustments. At 6’3″, some “walk behind” tools still cause me to bend at least some, but the Medusaw allows me to stand tall. The articulating handle helps it fold up neatly in its case for a smaller profile during transportation. If there’s a downside, it’s that the Medusaw Walk Behind isn’t an attachment you can get for your original Medusaw. You have to buy it in one form or the other – blame certifications in the US if you like. Regardless, it’s a nice upgrade that will run $699. The Skilsaw Medusa got an upgrade – and your back will thank you. Check out the walk behind Medusa! The Skilsaw Sawsquatch is already a beast capable of felling 4x lumber in a single pass. But what if you need more? Timber framers and their brethren often need to cut 6x material for beams and handheld saws for that capacity are few and far between. Enter the Super Sawsquatch – a 16-5/16″ circular saw with 15 amps of worm drive muscle to deliver 2.8 horsepower. With the ability to cut up to 6-1/4″ at 90 ° or 4-5/16″ at 45°, it makes other circular saws cower in fear. When it comes to competition, the Skilsaw Super Sawsquatch comes in nearly 4 pounds lighter at roughly 30 pounds with the blade. It’s a lot of saw to manage and it takes some practice to work it effectively. To help, there are two positions for the auxiliary handle. There’s also a dust port to collect Super Sawsquatch dust. At $699 including a clip on lower case, it’s the go big or go home saw of the year. 16-5/16" of Beast Mode – it's the new Skilsaw Super Sawsquatch taking on a 6 x 6! The Skilsaw Buzzkill 13-amp reciprocating saw is an excellent proof of concept that there are more ways to reduce vibration in this aggressive class. At 13 amps, it’s not designed to keep up with the 15-amp class, so we’ve been anxiously awaiting its big brother. We got to put the 15-amp model to the test at World of Concrete and it clearly still has impressive vibration reduction. How well does it hold up against the big names? We’ll have to wait until we get one in for testing. Our first impressions are that it’s very capable and feels like it should be able to hold its own against just about anyone. With a full feature set and $199 price tag, Pros will expect it to. Those are the best Skilsaw tools at World of Concrete 2018. What are you most looking forward to? Tell us about it in the comments below!